"This is a great snack to make for any gathering. 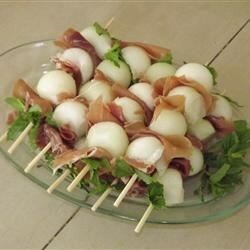 Balls of honeydew melon are wrapped in prosciutto and fresh mint to make a fancy appetizer with few ingredients." Place melon balls into a bowl, and sprinkle with lime juice. Stir gently to coat. Wrap each ball with a slice of prosciutto, and secure with a sprig of mint. Arrange on a serving tray. Refrigerate until serving. I used the mint only as a garnish and secured the proscuitto with a tootpick. Also, used a combination of cateloupe and honeydew melon balls. Loved the sweet/salty combination. If I ever make these again I will use imported prosciutto. I didn't care for the taste of the Boar's Head. Great appetizer for an Italian themed dinner!